Do you want a device that has zero internet connectivity, can't play games, has a screen that can only display two to six lines of text, and is no-longer being sold outside of ebay? Well, for many people those minuses turn this device into the perfect drafting tool. OK that last minus is a pain in the neck since in the unlikely event something happens you're kind of on your own. However even though these devices are a decade old, they're so simple there's not really a lot that needs to be worried over outside of an internal coin battery and general cleaning. 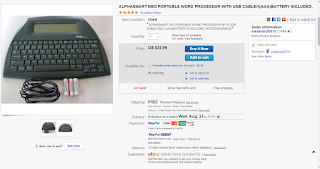 I first heard about the AlphaSmart when it was new and going for roughly $250. Right around that time netbooks became a fad, and in response rennessance learning slashed the price to $200, then a few years later to $180, and then $120, and then they stopped being made. As it turns out even education markets with a slant towards special needs can be out-competed by tablets, smartphones, and as much as the writing community that has sprung up around the AlphaSmart line of products has tried, there's just not enough to give a sustainable customer pool. To be fair unlike the iphone or traditional computers once you buy an AlphaSmart it pretty much is going to last you for an incredibly long time with no real need to buy a replacement, or an upgrade, or any real reason to spend more money unless you get supremely unlucky and your unit breaks. I have had rather dim things to say about the Freewrite (formerly hemmingwrite) as I compare it unfavorably to the AlphaSmart in concept and most definitely in pricing. 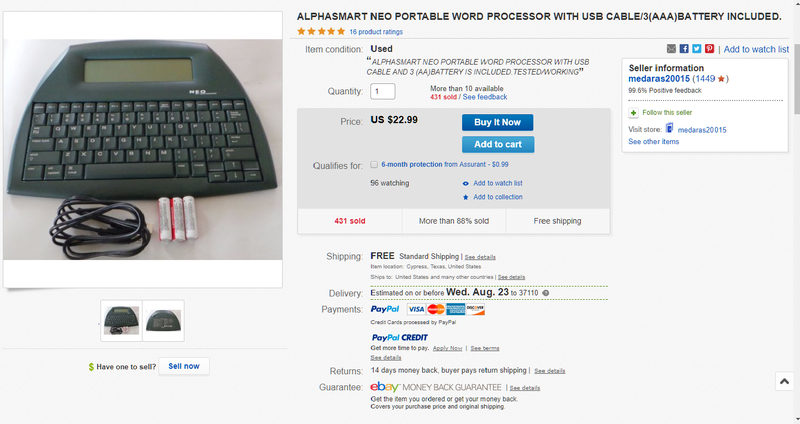 Let's take ebay out of the equation and put the AlphaSmart at it's introductory $250. That's still $150 cheaper than the hemingwrite, you have no dependance on a specialist cloud service that might or might not be around in ten years, and the neo's battery life is phenomenal. I've been using mine pretty regularly through the past week since acquisition and it's at 96%. Wiki, the official sources, and anecdotal user stories put the battery life at somewhere between 700 and 800 hours, with many users reporting 'well I hadn't changed them in a year I might as well put a fresh set in. 'Verses the freewrite getting 'a month' of use with a rather large asterisk behind that detailing the use required to get that 'month.' of battery use. Also while far from a guarantee I do know that the AlphaSmart flickr community has been petitioning renaissance learning for access to an a SDK or some other way to modify and add functionality to the neo line. After all while the device does what it does well and adding too much functionality would be bad, having the ability to adapt to changing conditions is always nice. Plus who knows, maybe if enough people show interest they'll try designing a new device. This blog post was written on my AlphaSmart neo while windows was merrily updating and thus leaving my computer unusable. Can't actually upload the post until my computer gets up and going, but for me it's nice to know I don't need to worry about file formats, OS, or anything since all I need to do is plug the neo in, mouse over to whatever text field I want to dump the text in, and hit the send key so my neo can type out everything from the currently open file onto the computer. It could be better, but I bought mine for $25 on ebay. It's easily worth $120, but in a world of tablets and smartphones I'm not sure it could sell at that price, and I don't know how much it would need to sell for to make money. In the meantime I'm going to use the one I've gotten and maybe, hopefully, down the road we will see a newer version made.